Authentic, made from scratch German food is what you will find at Augsburg Haus. All the key ingredients that go into our amazing food are imported directly from Ausburg Germany. Augsburg Haus is located at Liberty Square Shopping Center on Washington Road in Evans, Georgia. Adolf Hermann, owner and chef, has been serving up the best German food at one of the most popular places to eat in the Central Savannah River Area area since 2004. Starting from humble beginnings, Adolf grew up living in Ausburg Germany. He started from a young age working with his mother cooking for their large family. This experience cooking with his mother, honed his skills cooking in the Bavarian style. Adolf moved to the United States in 1992 at the age of 27, to attempt to live the American dream. He finally was able to afford to open his very first location in 2004 on Walton Way. This restaurant was only 1300 square feet, and would allow Adolf to grow a fan base of his amazing cooking. 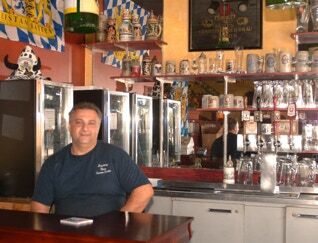 In 2009 Adolf moved the restaurant to a location that more than doubled the size of area that he had to serve his patrons. Now Adolf still enjoys bringing his mother’s Bavarian style cooking to the people he serves in the CSRA and invites anyone with a passion for food or a curiosity for fine foreign cuisine to try it for themselves.